"Kasukas" - "fur coat" - is a name for a layered vegetable salad that is very popular here in Estonia, especially during the cold and dark season. 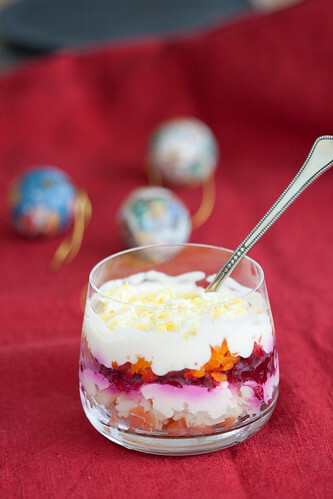 The salad has chopped cured herring as the bottom layer, topped with layers of grated or chopped beets, carrots, potatoes and other vegetables and "glued together" with thin layers of mayonnaise. 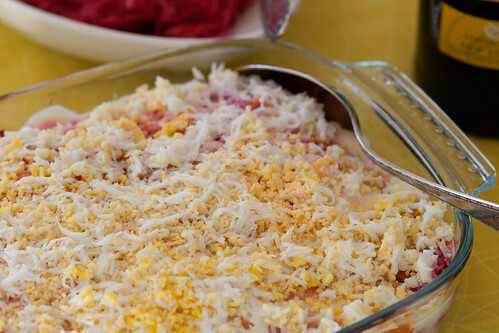 The recipe - or rather an alternative way to serve the popular "rosolje" salad - came to Estonia from Russia in the second half of last century. In Russia "fur coat" aka "shuba" is still one of the most popular salads on the festive table (here's a lovely English-language blog post about the traditional "cured herring under fur coat"), and the un-layered "rosolli" is also a must on Finnish Christmas tables). Whereas I love beets, I dislike cured herring, so I tend to skip that salad on buffet tables. When making this at home, I'd usually make a double portion and divide the salad between two glass bowls - one with herring and the other without. Until I came across a version using smoked salmon in Natasha's Kitchen blog. That was about a year and a half ago, and since then I've made this salad over and over again and converted many kasukas-haters into kasukas-lovers. Traditionally this salad is made and served in a big glass bowl that proudly shows off all the layers, and then it's spooned into serving plates (rather like a trifle). For a neater presentation, you may want to use individual glass bowls instead (see top photo). A note to my Estonian readers - I like making this with külmsuitsulõhe aka cold-smoked salmon (Pepe Kala makes a wonderful one! 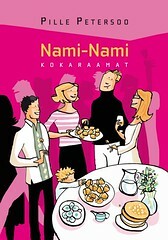 ), rather than with kuumsuitsulõhe aka hot-smoked salmon. Boil (unpeeled!) carrots and potatoes until soft, but not mushy. Drain, cool a little, then peel. Hard-boil the eggs, then cool and peel. 1. Cut the salmon into small pieces and scatter evenly at the bottom of a 2-litre (approximately 2-quart) glass bowl. 2. Grate the potatoes coarsely, scatter over the salmon. 3. Scatter chopped onion over the potato layer. 4. Gently spread about half of the mayonnaise over the onion layer. 5. 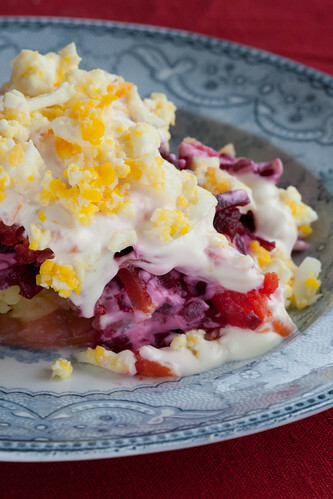 Grate the beetroot coarsely, scatter over the mayonnaise layer. 6. Grate the carrots coarsely, scatter over the beetroot layer. 7. Spread rest of the mayonnaise over the beetroot layer. 8. Finely grate the eggs, scatter over the mayonnaise layer. NB! As the mayonnaise is seasoned already, there is no need to season any of the layers with salt and pepper! Cover the bowl with clingfilm and put into the fridge for a few hours for the flavours to combine (and the beetroot colour to stain the other layers :)) The salad can be happily made on a previous day as well, as it keeps rather well. This recipe was also included in my latest cookbook, Jõulud kodus ("Christmas at Home"), published in Estonian in November 2011. Looked like a dessert at first glance; I love the colours! Joey - that's so interesting!!! 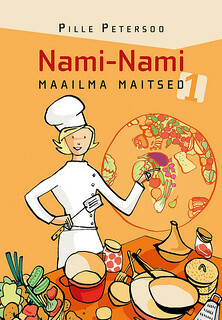 There are so many flavours and dishes that are same for you and me, despite the geographical distance! Scott - you should be pretty familiar with the flavours, considering your wife's Polish background! Pille, your kasukas looks very pretty! When I first made it at the NY Eesti Maja, I didn't have the benefit of a recipe, or pictures - someone described it to me and I tried to wing it! It was very popular though, with everyone, those who grew up with the traditional rosolje (because the taste is there!) and those more recently here from Eesti. What I did a little differently, was to slice the ingredients thinly, instead of grating the potatoes, roasted beets, and carrots. (Just don't like the texture of grated, cooked veggies.) I arranged the beets as the top layer, so that the cream on top would become pink sooner, and the gorgeous magenta/crimson juice would trickle down through the salad. (The carrots became the most interesting artsy colour!) As with rosolje, the sauce was 1/2 mayo (or a little less) and 1/2 sour cream (or a little more). Eating the layers, and mixing in the sauce to your liking as you go, makes one very aware of the flavours of the various components - a very interesting taste sensation. I really, really liked the salad. The salmon in it was very subtle and the vegetables were a nice compliment, even the beets, which I didn't expect to like so much. I was actually surprised that the mayo was enough as far as a dressing was concerned—generally I like some extra interest in a dressing, but in this case it wasn't needed. The mayo was plenty.